There were a number of excellent poems submitted to the October Poetry Challenge. Each of the three judges selected a different winner. This did not surprise me, since I know that there is always an element of subjectivity in a person’s response to poems. Grand Prize Winner is Michael Escoubas, whose poem, “Sailor at Subic Bay,” is the only poem selected for first place by a judge that was also picked as second place by another judge. This poem suggests that love that has gone astray may sometimes be restored. down her back, half-way to the floor. want a ticket to America. a dead branch over my knee. another sailor falls for Faye. I forgive you, forgive yourself. We won’t mention this again. 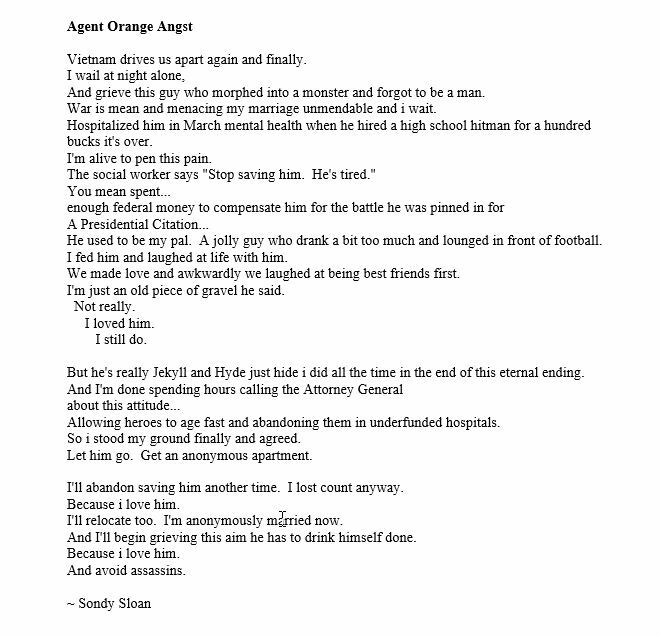 Judge Larry Turner wrote, “The language usage in this poem is very good, for example, "onyx hair that shines/ like polished Navy boots" and "fractures my engagement/ like cracking/ a dead branch over my knee." But the primary reason I chose it is the strong story it tells, and tells so well. There are two more first place winners. & the one that is always left behind. One thing judge Barbara Eaton liked about “bereft” was that she “found the idea of not ‘bending with the remover to remove’ very Shakespearean. Vietnam drives us apart again and finally. and forgot to be a man. War is mean and menacing my marriage unmendable and i wait. for a hundred bucks it's over. I'm alive to pen this pain. The social worker says "Stop saving him. He's tired." and lounged in front of football. I fed him and laughed at life with him. We made love and awkwardly we laughed at being best friends first. I'm just an old piece of gravel he said. So i stood my ground finally and agreed. Let him go. Get an anonymous apartment. I'll abandon saving him another time. I lost count anyway. I'll relocate too. I'm anonymously married now. And I'll begin grieving this aim he has to drink himself done. Pamela Larson says, “The more I dissect this poem, the more I like it. 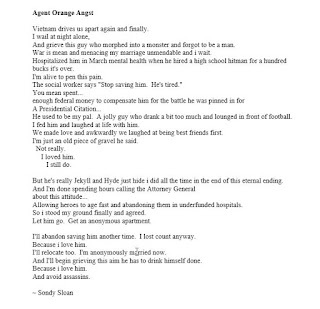 "Agent Orange Angst" is the one I would pick and here's why: The form of the poem, with the variation of line length, made me feel the many steps to make progress, only to be denied. The three indented lines toward the middle reinforced the feeling that the love is never going to stop. It keeps pushing forward. The use of I vs. i is interesting; showing a loss of self to the situation at times and to the narrator’s love for this person, no matter what. There is quite a bit of alliteration and I didn’t feel it was overbearing or too forced. I would have liked a more visual picture. However, I think the lack of it helped to show his being treated like just a faceless entity. NOTE: These poets retain copyright to their own poems. Michael Escoubas began writing poetry for publication in August of 2013, after retiring from a 48-year-career in the printing industry. Early in life his mother said, You have a gift for words; you should do something with that gift. He writes poetry, in part, because of his mother’s encouraging words. Michael also writes poetry because he believes poetry brings people together and that poets are menders of broken things. Michael has published one chapbook, Light Comes Softly, which is available as an eBook through Pronoun Publishing. Love can be wonderful. Terrifying. Magical. Vulnerable. Exhilarating. Risky. It can result in a long, tender relationship. Or a broken heart. The poems which follow are tales of love gone awry. Martha’s long black hair was coiled up tight. As businessman, his profits a delight. Farewell to Sandy, once my favorite. Let Martha’s world provide me what I lack. “Now I am six years old, the same as you. So I can beat you up.” And then she did. For this kind of love. Is out of fashion now. I would let you go. For I must hold my tongue. First published in Ethos, a publication of the English Graduate Organization of the University of Maryland at College Park (Spring 1987), p. 52.
no god has sent “the one” running to my arms. tone down my nerves while I turn up my charm. respond. We can chat for hours on end. if I don’t like her, I might like her friend. is everything I want. A love that’s true. I suggest it’s time we meet. Maybe coffee? She says we can meet at Café Ballou. cause she looks nothing like her profile picture. First published by Highland Park Poetry (Go to http://www.highlandparkpoetry.org/themusesgallery.html. Find the icon for 2011 Love Poetry toward the bottom right of the page, and click on it. These poets own rights to their poems. Please do not copy them without permission. See Poet Bios below. The October Challenge is to submit a poem about the dream of love going awry, Cupid’s arrow missing the mark, a “love relationship” not turning out as expected. The poem should be family-friendly—some children read this blog. Your poem may have a light touch, or it may be poignant. Title your poem unless it is a form that does not use titles. If you use a form, please identify the form when you submit your poem. Single-space and don’t use lines that are overly long (because the blog format doesn’t accommodate long lines). The deadline is October 15. Poems submitted after the deadline will not be considered. There is no charge to enter, so there are no monetary rewards; however winners are published on this blog. Please don’t stray too far from “family-friendly” language. No simultaneous submissions, please. You should know by the end of the month whether or not your poem will be published on this blog. Decision of the judge or judges is final. Barbara Eaton published her first poem at the age of seven. She was known to her late father as "Crazy Horse," and "Figgy Pudding." She teaches part time at Morton College, and serves as a dramaturg for the First Folio Shakespeare Company in Oak Brook, Illinois. Her poetry has been published in a variety of venues. Pamela Larson has been published in East on Central, bottle rockets haiku journal, the CRAM/JOMP series, both online and in anthologies by Dagda Publishing in the UK and on PoetrySuperHighway.com as well as in other anthologies and blogs. She is a member of the Arlington Poetry Project, Barrington Writers Workshop and the Illinois State Poetry Society.